At the moment of this writing Eva is lying in bed fast asleep. she should be because we had an action packed day. Allison is on Spa weekend up in Maine for a big time Knitting extravaganza. Knitting Tea and PJs, sounds relaxing. While she is away Eva and I are having some bonding time. We started with a leisurely morning. Eva had herself a waffle (frozen – she has enjoyed them that way since she was a teething baby.) I did some cleaning around the house. Allison is one lucky woman having me as a husband. Every time she goes away she comes back to a house cleaner than ever before. I know because I emptied the Dyson canister 4 times. I love that vacuum. I bought it for us but it is really my toy. I even did under the sofa and loveseat. I found treasures under there from the Mesozoic Era. But it got done. The house is looking great. Eva loves Hot Wheels. We played with the Loop the Loop set over and over. I found that not all the cars made the loop. The pickup trucks did great, the car that came with the set did too but some of the other cars were too long to make the loop. It didn’t matter to Eva she loved sending them down the ramp over and over. 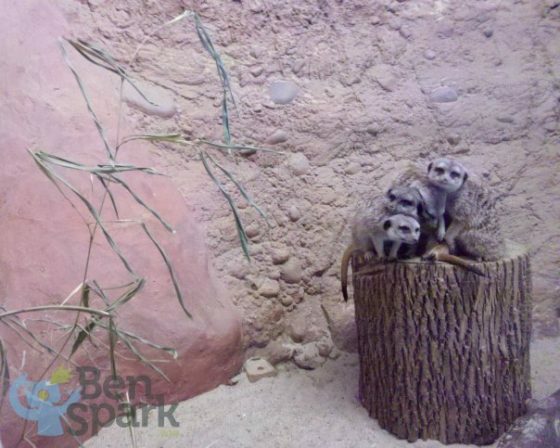 We needed some outdoor time so I decided that we should go to Capron Park Zoo to walk around to see the animals. We have memberships to Franklin Park Zoo but at the 1st of the year there is no longer reciprocation of admissions. However, admission was 1/2 price. I think that we’ll have to get a family membership to Capron Park Zoo. Photo Blunder of the day, I figured I’d just take my point and shoot with me. I forgot to take the SD card with me though. So, as we walked around the park and all the animals were out and about walking and I only had my camera phone with me. Even the snow leopard was walking around. I never see the snow leopard doing anything. We had a quick stop at the comic book shop and then a little lunch at McDonalds. Upon returning home we watched Elmo in Grouchland. It wasn’t too bad, I didn’t mind it either. Elmo usually goes right through me, however this was not a bad movie. Eva enjoyed it. We had a nice quiet night and Eva went right to bed after very little fussing. After Eva went to bed I had a great conversation with Kevin Metzger. He interviewed me for his Dadvocate project. I really want Kevin to create a great book and he’s looking for other Dad’s to talk to and to take his survey. Help out Kevin and maybe you can interview as well. Also if you take the survey you can be entered into a contest to win an iPad. I really can’t stand elmo either. Elmo is a tough one to get used to or tolerate. I don’t like that he talks about himself in the third person, very irritating. .-= Look at what Deborah wrote blog ..Welcome to FeedBurner =-.